Uber made a classic growth-oriented company mistake: it focused on recruiting new drivers rather than on retaining the ones it already had. Many of Uber’s problems in 2017 stemmed from its obsession with growth. Expanding its business and growing its marketshare often came at the cost of operational needs, such as providing human resources with training and tools to properly deal with employee issues. Uber invested all of its time and resources in recruiting new drivers and relatively little on retaining drivers. On a busy evening in February 2017, while America watched the New England Patriots face off against the Atlanta Falcons in the Super Bowl, Uber’s former CEO Travis Kalanick was having his own sort of showdown. It started off as a friendly UberBlack ride. Kalanick, who sat between two women in an SUV, shimmied to Maroon 5 as the driver, Fawzi Kamel, brought them to their destination. It ended, however, with Kalanick and Kamel in a heated debate over pay. Kamel claimed the company lowered the fares on its premium black car service. Kalanick denied it. The now infamous encounter, which was caught on video, validated the primary concern of Uber’s three million drivers: Kalanick — and, by extension, Uber — wasn’t listening to them. “Driver partners.” That was, and still often is, what the combative CEO and Uber called the contractors operating on the $69 billion ride-hail company’s platform across the world. To many of those drivers, however, after years of undercutting fares, raising commissions and refusing to listen to their demands, Uber was seen as less a partner and more a shadowy, money-hungry entity that fettered them to the company because of its hold on the market. 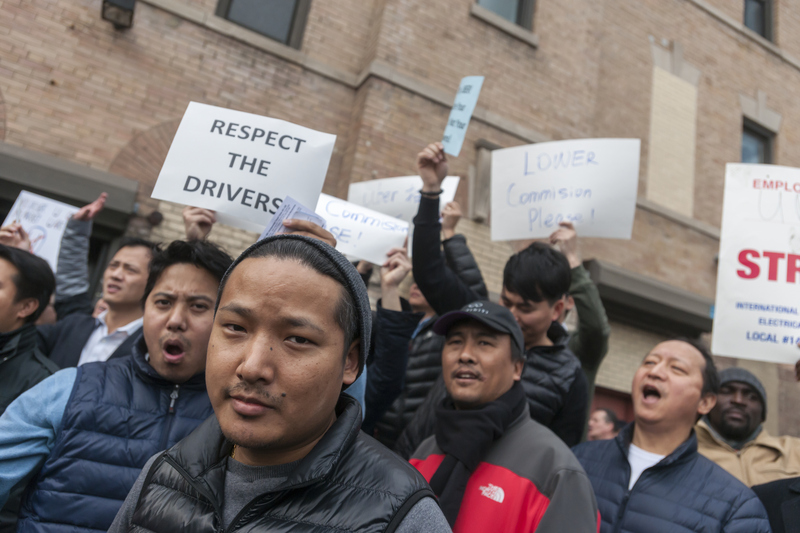 In spite of drivers’ many attempts to effect change through protests and sometimes lawsuits, the ride-hail company was rarely amenable to their requests or demands, often vehemently opposing some of the most-requested features from drivers, such as tipping. Still, Uber insisted it cared about the drivers. This year, however, circumstances forced Uber’s hand. Improving driver relations became more crucial than ever as competition grew and the supply of new drivers Uber could recruit or poach dwindled. Uber could no longer simply replace with new ones the sometimes dissatisfied drivers who left the platform. Maintaining its supply of existing drivers was an even more important factor in hitting profitability for a company that still loses $1.46 billion a quarter. That was compounded by the series of scandals Uber faced in 2017 — from executive turnover to allegations of stolen trade secrets, all of which ultimately led to a drop in marketshare. The company is in the midst of an upheaval under the tutelage of its new CEO Dara Khosrowshahi. With an eye on taking the company public in 2019, Khosrowshahi is attempting to atone for the sins of Uber’s past. But the effort to rehabilitate the relationship with drivers started under Kalanick and buoyed the faltering employee morale following his ouster. There is no clearer illustration of Uber’s shift toward drivers than the introduction of tipping. Kalanick, who focused much of his leadership on creating a top-of-the-line service for passengers, had long been concerned that riders would feel pressured into tipping their drivers and that it would result in a deterioration of the rider experience. But in April 2017, a little more than a month after the video surfaced, Kalanick joined a dozen or so of his executives — including the company’s newly minted head of product, Daniel Graf, and the head of driver product, Aaron Schildkrout — to discuss adding tipping to the app. The meeting, which Schildkrout spearheaded, was a culmination of years of internal pressure on Kalanick to allow riders to have the option to tip their drivers. By berating Kamel, the Uber driver, Kalanick had painted himself into a corner, and those staffers who had long fought for tipping seized on the opportunity. Schildkrout and his team of researchers, designers and product managers presented him with a series of charts and research that showed that the vast majority of riders and drivers wanted this feature, and that it could be done in a way that didn’t pressure riders. “Travis and other people’s resistance to tipping was very much that they didn’t want it to become a sort of meaningless obligation where the platform ... passes costs to the ... purchasing customer,” Schildkrout told Recode in August. More than that, it would show drivers that the company finally heard them. One-on-one meetings Kalanick had with the company’s chief economist John List and later with Schildkrout also served to convince the notoriously competitive CEO that tipping was a good idea. its tipping feature two months later. In doing so, the company marked the beginning of a 180-day driver improvement campaign — a cross-company effort that Schildkrout, as well as Uber’s regional general manager of the U.S. and Canada, Rachel Holt, had been working on since the winter of 2016. While that tipping conversation happened months into the company’s work on the driver improvement campaign, it’s emblematic of how people within the company leveraged Uber’s reputation issues to create a sense of urgency and fervency around making Uber for the first time ever a better opportunity for drivers. Interviews with executives Uber made available as well as several former and current employees suggest this is a major shift within the company that had traditionally been primarily concerned with the rider experience. The campaign was not without its missteps, and some drivers are still left wanting, but this was the first clear move by Uber to change not only the narrative but the actual workings of its driver operations. It wasn’t the first year the company tried to focus on the driver, but given the myriad scandals and an increasingly menacing business problem, 2017 had to be the year of the driver. As they did before the start of every year, Uber executives, including Kalanick, began discussing what the priorities should be for 2017 toward the end of fall 2016. To Holt and Schildkrout, focusing on driver retention was no longer just a moral obligation to treat drivers better, nor was it just about fixing the company’s image. It was a business problem and it was pressing. As many of its markets, namely the U.S., matured, the ride-hail company came up against a huge challenge: There were fewer pools of people who were qualified and needed or wanted to drive for Uber that it hadn’t already contacted. Of those who did try driving for Uber, about 30 percent churned — stopped driving for the company — every quarter, several sources told Recode. The company’s years of focusing primarily on new driver acquisition had caught up to it. Uber needed to figure out not just how to get new drivers, but how to keep them. So Uber began introducing new features aimed at making drivers’ experience easier and more seamless. In the first few months of the improvement campaign, the company attempted to answer drivers’ most frequent complaints: Tipping, pay transparency and customer support. The company also attempted to enhance its biggest value proposition for drivers: Flexibility. And here’s what drivers got. As of December 2017, drivers received $200 million in tips. Compare that to Lyft, which has offered a tipping option since it was founded about six years ago and only just paid out $250 million in tips as of June 2017. Drivers would be paid extra for long trips, they’d get an additional flat fee for every new pickup on an UberPool ride, be paid for every minute they waited for a passenger over two minutes and they’d have 24/7 phone support. Other features were more about the process of driving and the kind of information drivers were getting. By the company’s own admission, the specifics of what drivers were taking home versus what Uber was making was a black box. For instance, drivers have often complained about not knowing what their passengers paid and, at times, being paid less than what their riders tell them they’ve been charged. So the company started offering some basic information drivers didn’t have before, specifically, the price of each fare (what the rider pays), how much they earned from each ride and any discounts or subsidies that may have been applied to each trip. Astoundingly, prior to this change drivers had little idea what anyone was paying on each ride unless they asked the passenger. According to the company, the volume of complaints or questions drivers have about pay and other features have decreased over the course of the campaign. However, the company would not disclose the difference between ticket volume before and after the campaign. While some drivers recognized the effort the company was putting into making the experience better, others felt it was too little too late. There was always a question of whether the company was genuine in its efforts. To some, both internally and externally, it didn’t matter, so long as it made some improvements. But to Holt and Schildkrout, trust was a key factor in ensuring the campaign would be successful. That wasn’t always an easy feat to accomplish under Kalanick, who was forced out of Uber in June. For years, he thought of the rider as Uber’s primary customer. Though many felt the driver video was a moment that humbled the pugnacious CEO more than any other — leading to his first public admission that he needed to grow up — the incident with the Uber driver indicated otherwise. In the hours after the video was released, Kalanick and a few other executives broached the idea of apologizing and buying the driver’s cars to make it up to him. Less than than 48 hours later, Kalanick faced the driver again. The executive got into a long debate with Kamel in a subsequent meeting set up for him to apologize, as Recode first reported. Ahead of the meeting, Kalanick had intended to reach a rapprochement with the driver, these sources say. He and other executives — including Uber’s now Senior Vice President of Communications Jill Hazelbaker; Rachel Whetstone, the SVP of policy and comms at the time; Holt; Jeff Jones, the former president; and others — agreed he should meet with Kamel to apologize. During that gathering, Kalanick and others suggested he use his own money to pay Kamel for the cost of his cars. Kamel owns two cars that operate on Uber’s platform under a black car business called West Coast Limos. Since Kamel’s primary complaint with Kalanick was that Kamel bought cars to drive for Uber and had been losing money because of lowered fares, they discussed Kalanick possibly covering the depreciated value of the cars. The meeting took place within two days after the video came to light. Kalanick was advised to apologize and immediately leave. 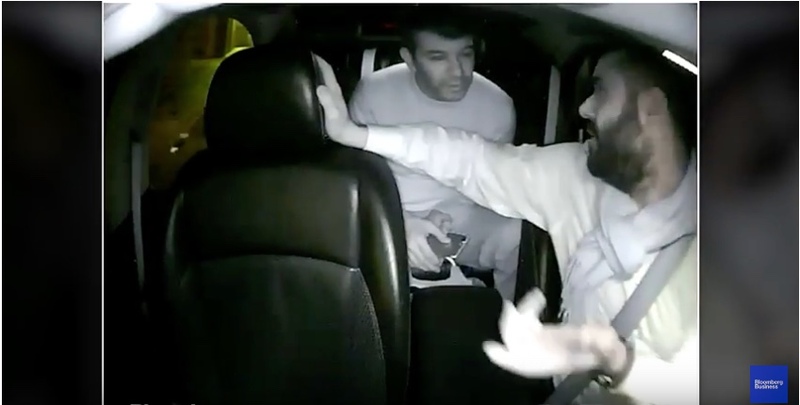 Instead, Kalanick spent an hour or so with Kamel, sources say, to express his regret for how he behaved but also to talk through many of the same issues they discussed in the video. Naturally, Kamel was upset in the aftermath of his original encounter with Kalanick. But a spokesperson for Kalanick said that the subsequent meeting was not argumentative and that it ended well. The spokesperson declined to comment on whether Kalanick gave Kamel any money. However, Kalanick offered Kamel $200,000, Bloomberg News later reported. At least one Uber executive was uncomfortable with the meeting. 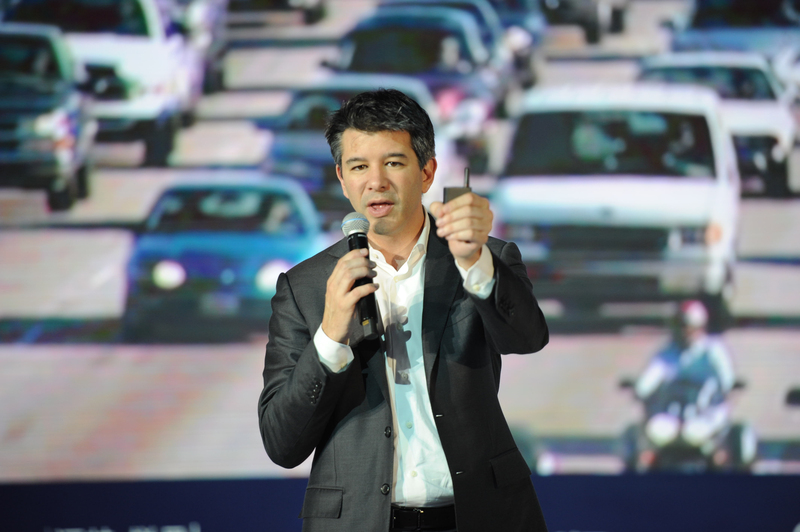 Kalanick was accompanied by Wayne Ting, the general manager of Uber’s Northern California operations at the time. After the meeting, Ting told a few executives at Uber that he was unable to get Kalanick to leave. Sources say he also expressed his frustration to leadership in an email and felt Kalanick acted irresponsibly. Salle Yoo, the company’s former chief legal counsel, acted quickly and made it clear Kalanick had to invest his own money and broker a deal with his own legal counsel — not Uber’s. Still, the driver improvement campaign went on as planned. Uber launched its crusade to retain drivers on June 22. A day later, under mounting pressure from major shareholders who were generally frustrated with his leadership, Kalanick formally resigned from the company. A dozen deputies, including Holt, took the reins of Uber. Under them, the driver improvement campaign became the rallying cry of the company. Many of Uber’s problems in 2017 stemmed from its obsession with growth. Expanding its business and growing its marketshare often came at the cost of operational needs, such as providing human resources with training and tools to properly deal with employee issues. Some say that is what led to the company’s mismanagement of the sexism and harassment claims Susan Fowler detailed in her essay. That was also the case, Holt said, when it came to creating a good experience for drivers. Instead, Uber invested all of its time and resources in recruiting new drivers and relatively little on retaining drivers. The company ran a sophisticated and often expensive driver recruitment campaign. The idea was drivers would use the service that had more riders and in turn more rides. By that logic, all Uber had to do was continue to recruit new drivers while it focused on making its service as efficient and convenient as possible for passengers. Uber used a combination of subsidies, promotions and a process called slogging — singling out drivers on competing services such as Lyft to convert them to Uber drivers — to grow its driver pool. Once a driver joined the platform, Uber would funnel more rides to the newcomers or to lapsed drivers using specialized software in an effort to show how robust the service was, or in the case of lapsed drivers, to encourage them to continue driving for Uber, sources familiar told Recode. The company regularly experimented with ways to ease the process for new drivers. Other examples include initially limiting UberPool requests until the driver got used to the platform. The company says it is not currently experimenting with funneling rides to new or returning drivers. But after completing their first five to 10 rides, for most drivers the number of ride requests would drop. So too would much of the company’s efforts to keep them on the platform. Uber had lost the trust of both the public and a large proportion of its employees as it grappled with the many public scandals of 2017. Morale was low as employees saw the ouster of Kalanick, the co-founder and company’s primary evangelist. Though some lamented his departure, others saw this as an opportunity to start fresh. For the first time, teams across Uber were focused on making good on their promises to drivers instead of just figuring out how to win at all costs and grow the business. The campaign was the first cross-functional effort of its kind, Holt told Recode, banding together Uber’s operations, engineering, marketing and other teams. In an email to staff introducing the campaign, obtained by Recode, Schildkrout and Holt called for the full collaboration of all of Uber’s employees. It became the reason many of its employees across these functions stayed, according to many sources. “I think we have a privileged moment where the business need and the moral need are perfectly aligned,” Schildkrout told Recode. Schildkrout, the co-founder of dating site HowAboutWe, has worn many hats since he joined Uber in 2015. He started as the head of data and made his way across the company as the head of growth and then the head of rider product. As it happens, the head of driver product would be his last role at Uber. 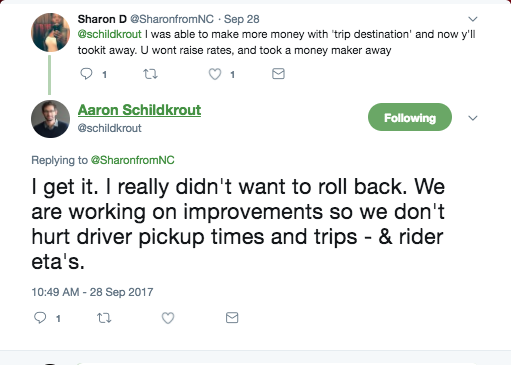 Schildkrout, who had been considering taking time away from the company before the campaign, was among those who stayed at Uber to see the driver improvement project through. Just a day after Uber launched the last part of its 180-day driver improvement campaign in December, he announced he was leaving the company. “This last year of work to transform our relationship with drivers has been one of the most gratifying experiences of my life,” Schildkrout wrote in an internal email announcing his departure. The company is hoping that the steady drumbeat of new features for drivers will help build a more solid foundation for their frayed relationship. But the elephant in the room, drivers told Recode, are the low fares. However, there’s little chance Uber will raise the rates at which it pays its drivers. The company argues higher fares would drive down volume, ultimately resulting in the same or less income. One driver in the Bay Area, Daryl Townsend, has been driving since 2014 and says if the fare goes any lower he’ll stop using Uber. Overall sentiment, however, is improving. Over the course of the campaign, Uber surveyed select drivers after each new batch of features was launched. By November 2017, favorability among drivers improved about 7 percent since the campaign started in June, according to internal charts Recode obtained. Churn, Uber said, has improved too but wouldn’t say by how much. Though the company is optimistic about the impact the campaign is having, a single moment clearly illustrated the frailty of its driver relationship. In the third month of the company’s campaign — which focused on promoting flexibility — Uber introduced a number of improvements around its driver destination feature. The feature allows drivers to specify a location they want to reach, allowing them to maximize their time and accept rides that are going in that direction, especially when they want to finish working for the day and head home. Previously, the company allowed drivers to do this only twice a day. After testing the feature in some cities and seeing little degradation to wait times, the company increased that to six. According to Schildkrout, Uber even contemplated allowing drivers to pick as many destinations as they wanted every day. But upon launching the additional driver destinations and heavily marketing that to drivers, Uber quickly realized that it was hurting its marketplace. In some cities, a few routes were not being serviced because drivers’ destination preferences took supply away from certain routes. It also increased the time it took to pick up passengers. After attempting to solve the problem with subtle changes — such as setting drop-offs as anything within a mile of the driver destination — Schildkrout and an emergency response team realized it was getting worse. In a matter of days, Uber rolled back driver destinations from six per day to two in those cities. Still, because the company had marketed the feature so heavily and drivers liked it so much, those problems persisted in markets where usage was still very high. So, the company added additional limitations during specific times — such as peak hours. For drivers, this was a clear moment of Uber going back on its word. The promises they’d been making since the start of the campaign meant nothing. Uber would always pick the marketplace over them. But Schildkrout insisted the deterioration of the marketplace also hurt drivers. Higher ETAs to pick up riders meant fewer rides for drivers and more time driving without a fare. The company has been working on new and more refined features, he said, that actually respond more specifically to the needs of drivers instead of a feature that acts as a one-size fits all solution to the desire to have more control. Still, Schildkrout spent a good deal of his time responding directly to drivers who tweet at him. This moment, deep into the campaign, illustrated how fraught Uber’s relationship with its drivers still was. The question of whether the company was actually listening to them remains at the heart of the issue. Uber contends it is listening to the drivers. In fact, the process to come up with new features proves they’re listening, sources inside the company said, because it starts with driver feedback. The company has a squadron of researchers who embed with the driver team and gather qualitative and quantitative data through driver interviews and other methods. That team works to bridge the gap between what drivers say they want and what features the company can actually develop that would solve those pain points. That, for example, was how driver destinations and driver profiles were originally conceived. For destinations, drivers said they wanted more flexibility and control over where and when they drove. Driver profiles, on the other hand, came out of complaints about rider behavior. Drivers wanted riders to behave better and respect them more. The profile, which tells riders about the driver and features any compliments other riders might’ve given them, was an attempt at humanizing the rider-driver relationship. Each part of the process, the company contends, responds to specific driver issues and feedback such as earnings transparency. Moreover, Uber employees are now encouraged to drive on the platform to get a first-hand feel for what it would take to feel truly like a partner. The campaign may have ended officially but Uber’s work is not over. The company concedes that this was about getting the fundamentals of the relationship right so that it could continue to improve and innovate upon the driver experience.